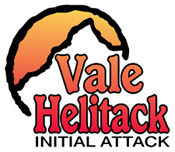 Equipment Resources assigned to Initial Attack in the Vale District include 17 fire engines (6 type 6 - light and 11 type 4 - heavy); a tactical tender; a bulldozer; an exclusive use helicopter with nine person helitack crew; and an exclusive use Air Attack platform. There are seven guard-stations positioned throughout the district: Baker, Burns Junction, Jordan Valley, Juntura, Snake River, Unity, and Vale. On a 20 year average the Vale District has averaged 52 fires for 51,737 acres burned; out of 52 fires 36 of those fires were started by lightning. Interagency Hotshot Crews provide an organized, mobile, and skilled hand crew for all phases of wildfire suppression. The sponsoring unit (Vale) ensures compliance with established standards. The arduous duties, specialized assignments, and operations in a variety of geographic areas required of IHCs dictate training, equipment, communications, transportation, organization, and ensuring operating procedures are consistent for all agency IHCs. The "Shots" are managed under the National Interagency Hotshot Crew Operations Guide. 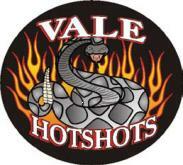 Bart Yeager is the Vale Hotshots' Superintendent. Glen Hietz and Pete Hearn are the Assistant Superintendents. The Snake River Valley (SRV) firefighting program was developed at Vale, Oregon, by the Bureau of Land Management (BLM). The severe fire season of 1963 demonstrated a need for a well trained and organized firefighting force. Vale is the home of the Snake River Valley Fire Program, which for 47 years has produced one of the largest trained groups of Type II and type II-IA crews. In 1964, the BLM recognized the potential in the large population of Mexican-American farm laborers in the Snake River Valley of Western Idaho and Eastern Oregon. The formal structuring of the SRV program made it possible to utilize this tremendous work force, along with high school and college students looking for summer work, into a largely self sufficient organization of between 300 and 500 firefighters ready to respond to wild land fires or natural disasters anywhere in the United States. Wild land firefighting is one of the most dangerous occupations in the United States, primarily because of risk to employees and isolation from medical assistance. Although quite elementary at first, the training program has increased over the years in scope, content, and sophistication. Safety is the number one priority. Each spring 75 to 100 rookie firefighters spend four days of intensive classroom training and two days of hands-on field work exercises in a natural wild land setting. Included in the training are fire fighting safety, crew structure and chain of command, fire equipment operation and maintenance, hand tool use and maintenance, fire fighting strategy and techniques, weather and fire behavior observation, and many other fire fighting skills and abilities. Many of the SRV crew members, squad leaders, and Crew Chiefs have from 10 to 35 years of actual experience on all types of wild fire assignments and natural disasters. As crew bosses retire, crews are passed on to squad leaders working up the chain of command. They are proud of the fire fighting heritage passed on from one generation to the next. Their willingness to work hard under difficult conditions is exceptional. The SRV crews are guided by a tradition of excellence and pride that is part of the best wild land fire fighting group in the nation. The SRV program has also become a useful tool for those seeking an opportunity for a full time, career wild fire position with government agencies such as the Bureau of Land Management (BLM), US Forest Service (USFS), Bureau of Indian Affairs (BIA), Dept. of Natural Resources, or various state forest agencies.